Saturday was the Summer Fair at Hexham Middle School and Transition Tynedale were asked to participate in activities and to promote the community garden that is within the school grounds. Thanks to the commitment of many active TT-ers, we did a sterling job in helping to make the fair a huge success. We provided a straw bale obstacle course, photo-orienteering and manned the plant stall, along with the usual TT information of course. But that wasn’t all. Hot on the heels of the Summer Fair we held a BBQ in the garden itself, to help promote the garden and as a social event for everyone involved with Transition Tynedale.It was an early start for me, Megan, David and Tim as 40 bales of straw were delivered to the school, courtesy of a local farmer. We quickly thought up and layed out a pretty good obstacle course, with steps, tunnels, jumps, a chicane and a tarpaulin for crawling under. Megan’s daughter Bronwyn did a great job of testing the course – quite a few times! Later on some older children gave it another test run, and made a very good change – The ceiling of the long tunnel collapsed in the middle, but rather than fixing it, they adapted the tunnel to be duck-under, jump-over, duck-under obstacle. It was a really good improvement, and proved very difficult to navigate without being pinned down by a bale. Come the opening of the fair, Phil and Tim manned the obstacle course for the full 2 hours. Recording times for every competitor and awarding prizes every quarter hour. I worked as an out-fielder repairing the course as it broke, and was ably helped out, first by Megan’s son Lewis and then by Karen’s daughter Imogen. Manning the plant stall was Sue, Liz and Barbara, and there seemed to be a nice selection of cake there too. Possibly to encourage people along to the BBQ. Megan was close at hand with the photo-orienteering. This involved a set of long-shot and close-up photos of various parts of the school site. The competitors needed to locate the close-up, and then find a hidden number to win a prize. It was a hard-sell trying to lure people away from the main action, but quite a few entered. And they would have come across the community garden, as Tim surrepticiously laid out the course to include our garden. A devious marketing move maybe. 2 hours flew by, and before we knew it the BBQ was upon us! So quick smart and with many hands, we started gathering the straw bales and loading them into and on top of Chris’ hay wagon (car) and over to the garden… where the press were waiting! The Hexham Courant had kindly sent along a photographer, and later Helen Compson to report on our event. I’m looking forward to seeing all our efforts in print and some good photos of the kids. We had a good turnout of people at the BBQ, and many had brought their own supplies. We had a wide range of delicious savouries, cake and juice. 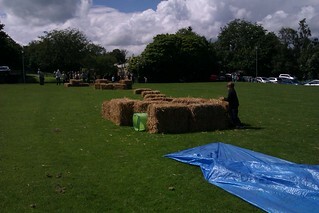 And with the straw bales as seating, it was quite an idylic scene. Just the setting to relax after a very, very busy day. And now, does anyone need any straw?! I agree – we all had a great time – and what about the Courant article ?!! Excellent!! Well done everyone – thank you!